Starting at the Bubble Pond parking lot and trailhead, the Cadillac West Face Trail isn't as well known as the other routes to the top of Cadillac Mountain, but it is the most thrilling and precipitous! 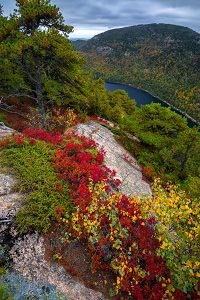 This short but strenuous stretch of trail zigzags its way up the steep rock formations of the west face of Cadillac Mountain, offering wonderful views of Bubble Pond and Eagle Lake below. 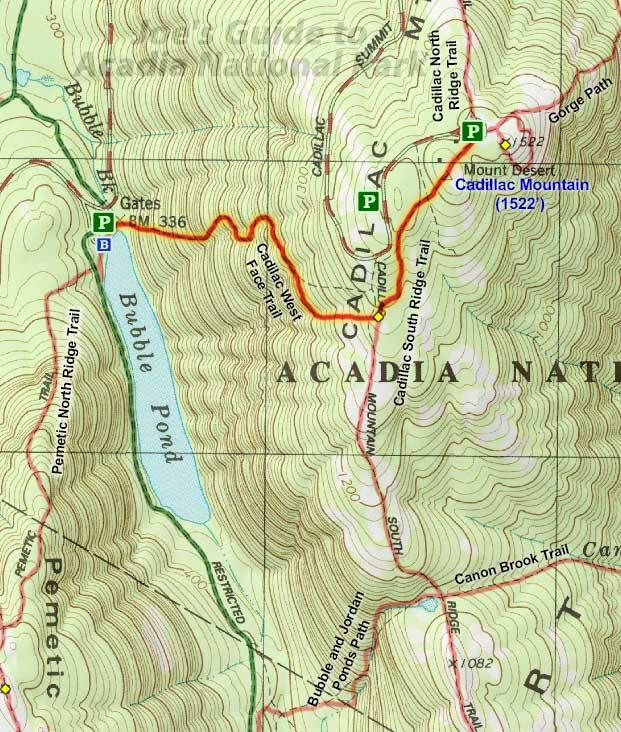 The trail then joins up with the more popular Cadillac South Ridge Trail to make its way to the top of Acadia's highest peak. WARNING: This trail has several scrambling obstacles and exposed sections, so caution is recommended. This hike is not suitable for small children or anybody who has a fear of heights or who isn't steady on their feet. From the Bubble Pond parking lot and trailhead, you get a nice view of Bubble Pond to the south with Pemetic Mountain to the right (west) and the impressive west face of Cadillac Mountain to the left (east). (Before you begin your hike, you may want to take a look at one of the famous carriage-road bridges, Bubble Pond Bridge.) Walk east along the north shore of Bubble Pond to find the trailhead marker for the Cadillac West Face Trail. This ingenious route heads up the steep mountain face and hikers have to navigate through several forested boulder fields and scramble up several granite ledges. 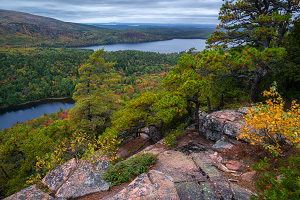 As you zigzag up the mountain face, you will get better and better views of Eagle Lake to the northwest and Bubble Pond to the southwest with Pemetic Mountain in the near distance and Penobscot and Sargent Mountains in the far distance; the views are some of the best in Acadia. Take great care on this trail as most of the slabs of granite are sloping outward and there are several exposed sections that could be intimidating to some. Soon enough, the trail will mellow out a bit as you make your way to the top of the dome and reach the junction with the Cadillac South Ridge Trail. From here, you probably want to continue all the way to the top of Cadillac Mountain, but with so many interconnecting trails and carriage roads in the area, there are many alternatives for loop hikes. Note that it is also possible to descend the Cadillac West Face Trail, but it can be a bit more intimidating than going up; take great care at many of the exposed obstacles and make it down safely! The Cadillac West Face Trail isn't often included in any greatest hits lists of hiking trails in Acadia, but this is a really fun stretch of trail if you're not afraid of heights! It's not as intimidating as the Precipice Trail or the Jordan Cliffs Trail, but it does offer great views from its exposed ledges. This would be a fun one for anybody looking for some good vertical.